At Crystal Bartenders, we hope you will have a merry Christmas! So we will talk about the traditional holiday drink, eggnog, and the history behind it. 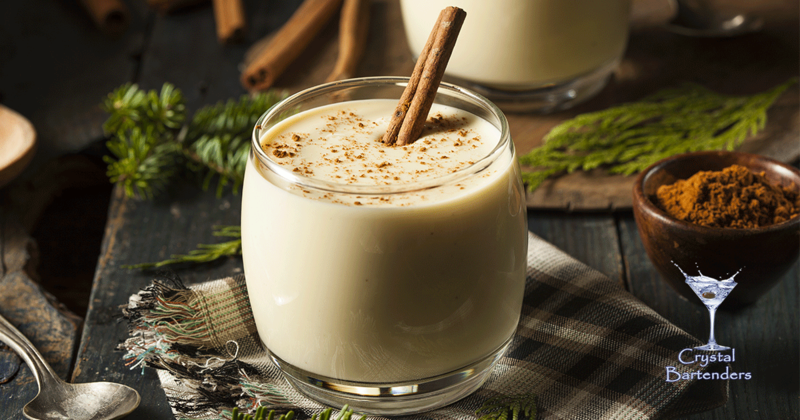 According to TIME, eggnog originated from the British medieval ale drink that was hot and milky. However, it was not until the 13th century when monks the traditional eggnog came to be, and it was when monks would make possets from figs and eggs. Afterwards, people thought that the drink would bring them well-being and fortune, because it was made from ingredients that were consumed by the wealthy classes. It was not until when the ingredients for eggnog became affordable to the masses, the drink became known to be a holiday drink in the 18th century on American colonies. The farms on these colonies raised an abundance of cows and chickens, which were able to produce plentiful eggs and milk for the drink. Also, they were able to produce more rum, which is now the essential alcohol ingredient for eggnog. The name eggnog also comes from the 18th century, but it was derived from the British slang for a wooden cup, which is “nog”, or they say the slang word for a strong beer, “grog.” They combined the two words, and that is how the word eggnog came to be. For tradition, we will share George Washington’s original recipe, and he preferred his eggnog heavy on the booze side. First, mix all the alcohol together in a bowl or pitcher. Then separate the egg yolks from whites, and beat the yolks in a separate bowl. Then you will add sugar, and mix them together really well. Also, you will save the whites for later. After, you will add milk and cream to the mix, slowly beating it. Then you grab you egg whites, and beat them until they become still in a separate bowl. Then you will slowly fold them into the mix. After that, you will add the mix to the alcohol mixture. Then let it sit in the refrigerator for a week. But make sure to taste it to see if it is okay. Now, you know the history behind and eggnog, and George Washington’s traditional recipe! And have a Merry Christmas and a happy New Year!